It’s rarely mentioned by the ethanol haters and touted by the rest, distillers grains. Just ask any livestock producer using it, the stuff works and it’s cost effective too. Now a new report shows that its feed value and production efficiency are even better than originally thought. According to the U.S. Department of Agriculture, one ton of distillers grain can replace 1.22 tons of corn and soybean meal. This can be attributed to the feed’s higher energy and protein content. USDA also noted that instead of just 1/3 or 33% of the corn being used for ethanol coming back as distillers grains, it’s actually around 40% (weight). 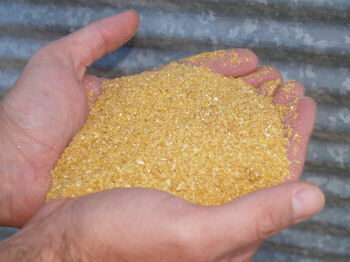 Most people don’t realize that the ethanol process only removes the kernels starch content leaving behind the protein, fat, fiber and other nutrients for livestock feed. This year the United States will produce 13 billion gallons of renewable ethanol fuel and 39 million metric tons of distillers grains. That amount of distillers grains is equivalent to the 4th largest corn crop in the world. DDGs will displace more than one billion bushels of corn for feed in the U.S. this year alone and 1/4th of it will be exported. Through ethanol production, America’s family corn farmers are reducing our nation’s dependence on foreign oil and feeding countries around the world by utilizing co-products like DDGs, efficiently using corn to produce both Food and Fuel. This entry was posted in News and tagged co-product, corn, DDGS, distilelrs grains, ethanol, export, farmer, South Dakota.